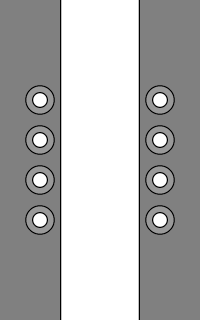 A decorative lacing with each row looped under the previous row, forming a diagonal series of loops that appears to 'cascade' down the shoe. • Begin with the shoelace fed through the bottom-left eyelet, with the inner (blue) end much shorter than the outer (yellow) end. • The inner (blue) end runs all the way up the inside and out through the top-left eyelet. 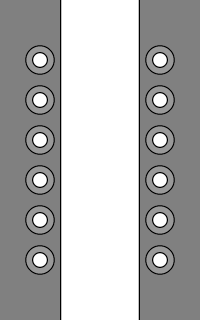 • The outer (yellow) end runs across on the outside and is peaked towards the right side before feeding into the bottom-right eyelet. • The right (yellow) end runs straight up the inside and out through the next higher eyelet, then loops under the previously peaked row. • The right (yellow) end is once again peaked on the right side before continuing across the shoe and into the adjacent eyelet. • Continue up the shoe, alternately running straight up the inside or across on the outside and looping under the previously peaked row. • On shoes with an odd number of eyelet pairs, finish with a diagonal segment on the inside to emerge through the top-right eyelet. 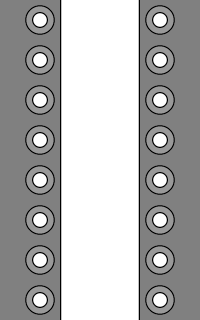 After emerging from a right-hand-side eyelet, feed under the right side of the previously peaked row and out at the bottom before continuing over and to the left. 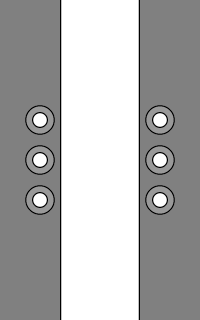 After emerging from a left-hand-side eyelet, feed over the left side of the previously peaked row and in at the bottom before continuing under and to the right. The left and right shoes can be laced in reverse (mirror image) to end up with a symmetrical look. PUMA Mihara Yasuhiro sneakers with Cascade Lacing. 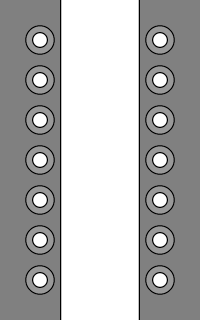 Lengths available: (N/A) 27" 36" 36" 40" 45" 45"
Longer ends if existing shoelaces are re-used (+18% on average). 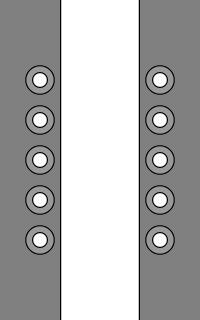 Shoelaces similarly looped under previous rows. Similar looking outcome using a totally different technique. This page last updated: 09-Feb-2019. Copyright © 2004-2019 by Ian W. Fieggen. All rights reserved.